SOMERVILLE, Mass. – The Boston Breakers ended their five-game winless skid by staking a 3-2 upset win over first-place Sky Blue FC at Dilboy Stadium on Sunday. 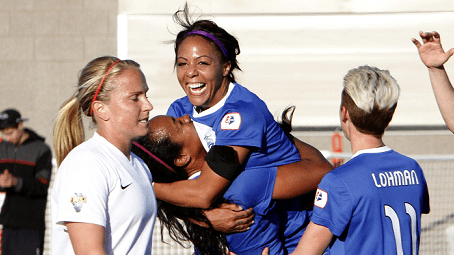 Sydney Leroux scored a pair of goals in the 29th and 41st minutes, while Mariah Nogueira tallied in the 35th minute. Sky Blue scored its goals from Sophie Schmidt and Monica Ocampo in the 31st and 58th minutes, respectively. Schmidt forced Sky Blue to finish the game shorthanded after she was red carded in the waning moments for throwing the ball at Breakers defender Jazmyne Avant in frustration. Breakers keeper Alyssa Naeher finished the match with six saves to preserve her first victory of the season. Avant, who was signed for defensive depth only days before the match, wasted no time getting involved in the attack when she delivered a low drive into the middle of the box that skipped past Joanna Lohman but reached Leroux, who tapped the ball into the back of the net. The early lead didn’t last long, though. Schmidt picked up an errant back pass out the midfield and with only Naeher to beat, the Sky Blue midfielder looped into net in the 31st minute. But four minutes later, the Breakers reclaimed the lead the lead when Nogueira converted a Katie Schoepfer corner kick in the 35th minute. Leroux scored the eventual game winner in the 41st minute when she latched onto the loose ball near the rear and volleyed it into the back of the net to give the Breakers a two-goal lead going into the half. Sky Blue pressed ahead in the second half, and found paydirt in the 58th minute when Ocampo pounced on a rebound that Naeher failed to corral then punched it through to put her club within striking distance. But Naeher was called upon to keep the guests from scoring again in the latter stages. After Schmidt brazenly beat Kia McNeil inside the area, she tested Naeher with a dangerous shot that the Breakers keeper denied. Naeher made another game-saving stop in the 88th minute after Ocampo beat the Breakers defense and fired away. In stoppage time, Schmidt vehemently protested referee Katja Koroleva’s decision to award a throw-in to the Breakers in the Sky Blue end by hurling the ball at Avant in frustration. Koroleva issued Schmidt a straight red card, as Sky Blue ended the game with 10 players. The result was measure of revenge of sorts for the Breakers, who embarrassingly lost to Sky Blue 5-1 on June 1. With the winless streak in the rearview, the Breakers hit the road for a tough, three-game road set that’ll take them to Seattle, Portland and New Jersey.